Many Knopf cooks are iconic, but perhaps none so iconic as Julia Child. Legions of chefs have been inspired by her, including Julie Powell. Cooking in a miniscule NYC kitchen, Powell was so inspired by the challenge that Julia’s career provided that she took to chronicling her kitchen adventures through Mastering the Art of French Cooking in her blog, the Julie/Julie Project, which serves as one half of the story behind Julie & Julia, the upcoming movie written and directed by Nora Ephron, starring Meryl Streep and Amy Adams. 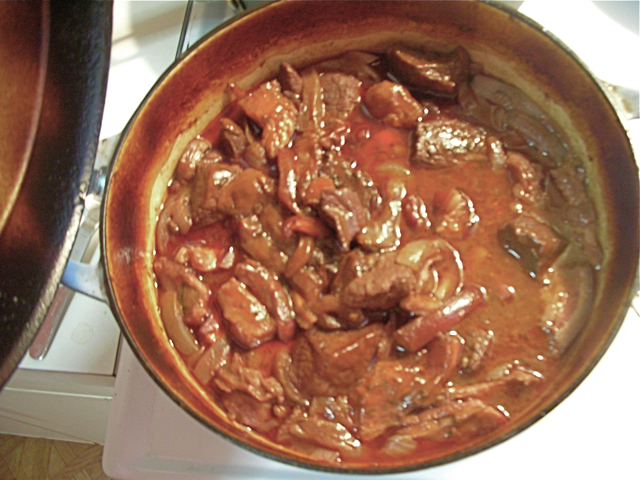 After seeing an advance screening of this marvelous movie, I had to go home and attempt the film’s signature dish, made repeatedly throughout the film: Julia Child’s Boeuf Bourguignon, beef stew with bacon, onions, and mushrooms. 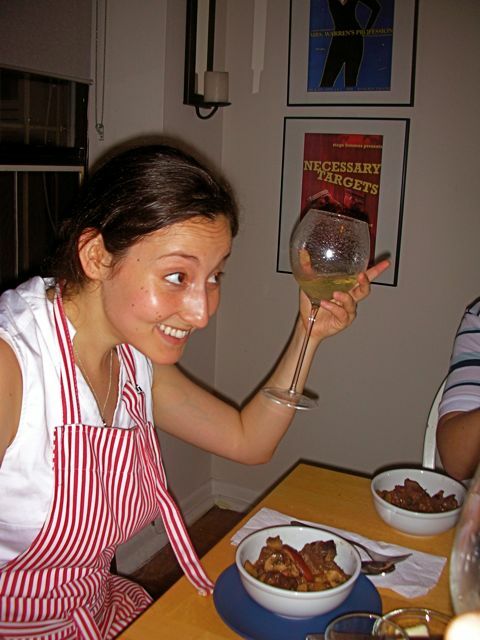 As Julia, Julie (twice, since the first one burns after one too many vodka tonics), and Judith Jones, Julia’s original editor at Knopf, each attempt this recipe, each one swigs from the red wine bottle and exclaims “yum!” at the delicious concoction. As Judith said in her memoir, “Et voilà! 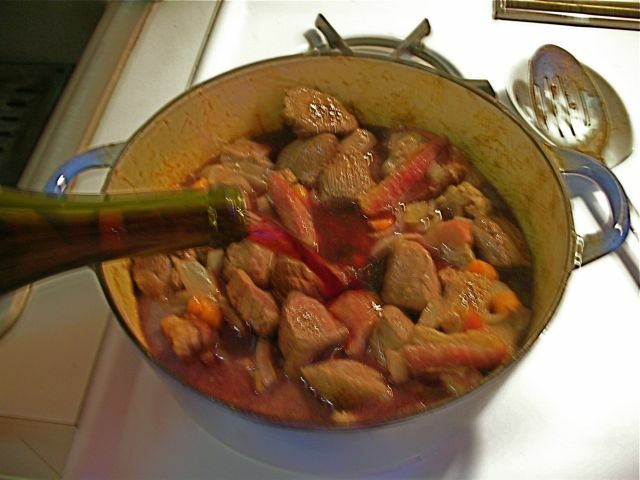 Evan and I agreed that it was the best boeuf bourguignon we had tasted since leaving France.” This recipe does not disappoint—it is every ounce the delicious, flavorful experience it looks in both the movie and Julia’s cookbook. It’s also the Knopf recipe: challenging, no question, but worth every bit of its challenge. A reward for the most adventurous and ingenious home cook to savor. Shopping was easy (and cheap! Now’s a good time to buy stew meat), but this dish is definitely an indulgence—bacon fat abounds—so instead of Julia’s recommended side dish of boiled potatoes, I stuck with some crusty bread and salad. 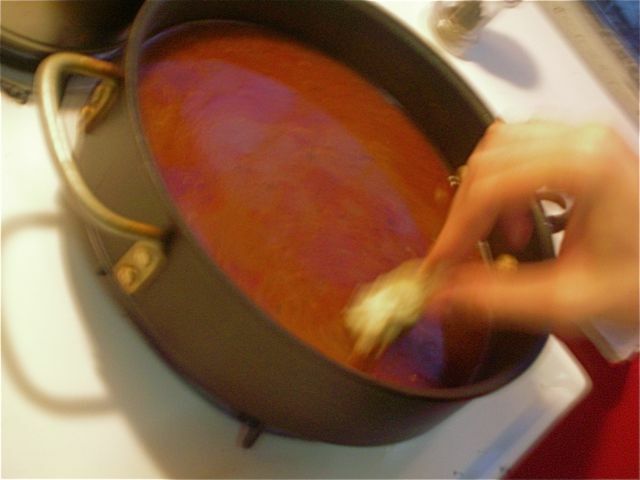 One pot of stew, one loaf of bread, and a big bowl of salad serves 7 people just fine. 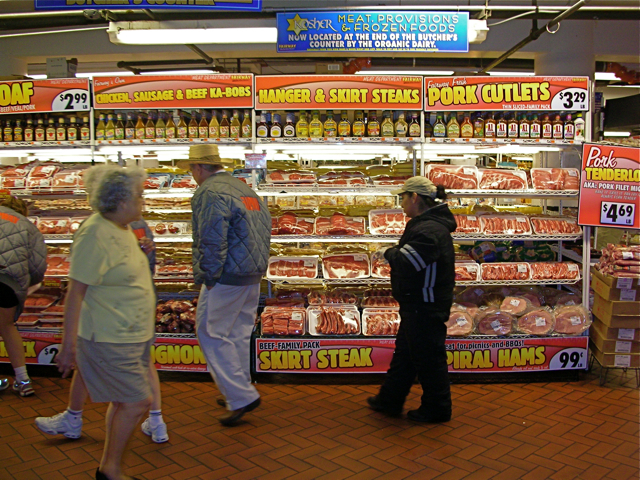 This recipe gave me an excuse to visit the uptown Fairway “cold room,” an enormous walk-in freezer. Check out the awesome Fairway parkas! 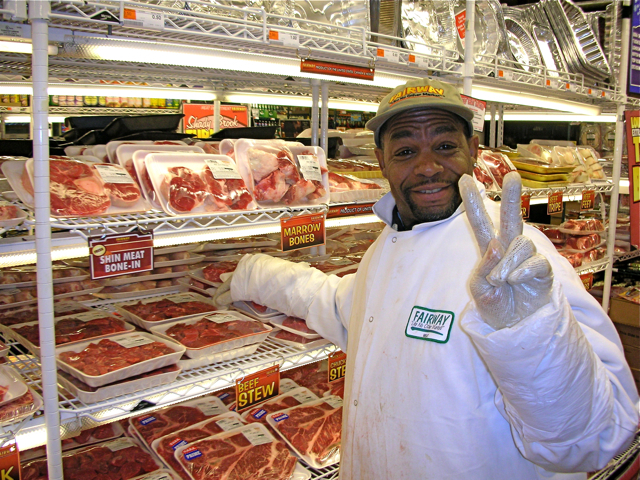 George, one of the highly knowledgeable butchers in the meat department, was more than happy to help me. This recipe is basically about tackling the process of cooking meat and bacon to bring out their most vibrant flavors. We can’t reprint the full recipe here, so it’s imperative to get your hands on a copy of Mastering the Art as you follow along. 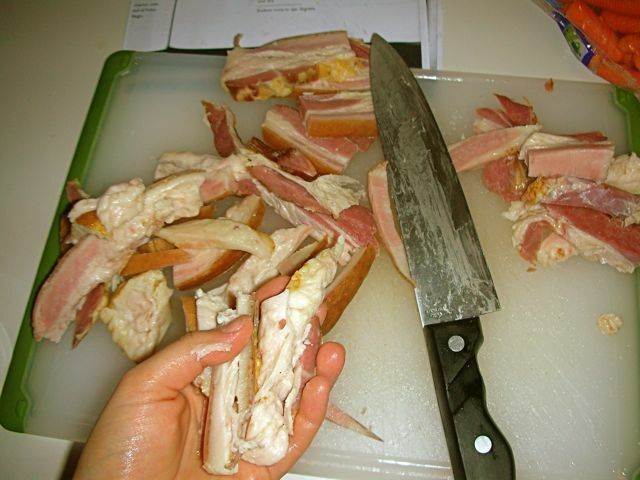 As I was slicing this up, I was silently singing to myself, “Jew cutting up bacon, Jew cutting up bacon…” But trust me, this recipe is worth breaking religious laws for. Per Julia’s instructions, I cut the bacon into lardons, 1/4–inch long sticks of meat and fat with the rind (the caramel-colored hard edges) trimmed off. This was simmered in water, drained and dried, then sautéed in olive oil until the bacon flavor seeps into the olive oil. I then added my beef (making sure to blot dry each piece in paper towels so it would be dry enough to brown properly) to the oil until browned, then swapped it out for chopped carrots and onions. While the stew was simmering away in the oven, I prepped the brown-braised onions and mushrooms in butter. 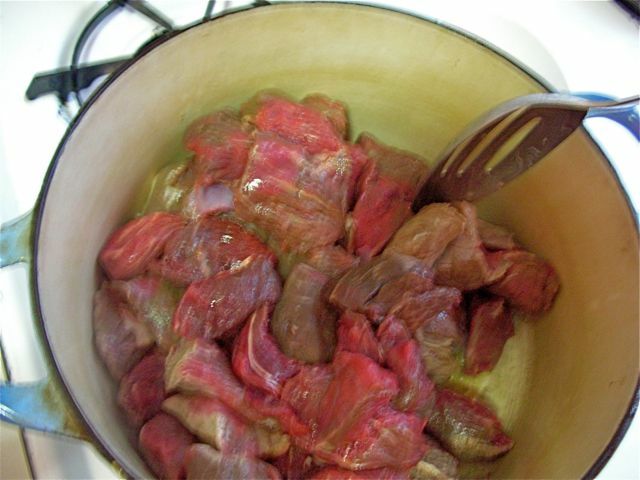 (These are separate JC recipes, but they must be included in the bourguignon, so they’re a must-make and very delicious.) First, the Oignons Glacés À Brun, a.k.a brown-braised onions: basically just very deliciously pearl onions browned in butter and oil and infused with the herbs in a bouquet garni, the classic French Provencal ingredient of a cheesecloth sack of parsley, thyme, and bay leaf. 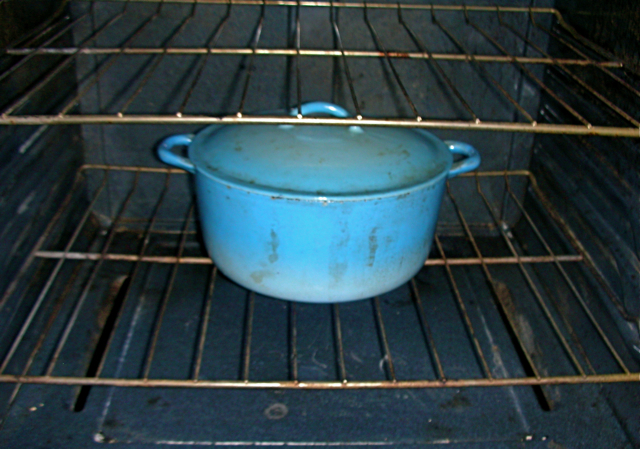 Once covered with wine or stock, the onions simmer slowly for almost an hour until they’re tender and almost caramelized. 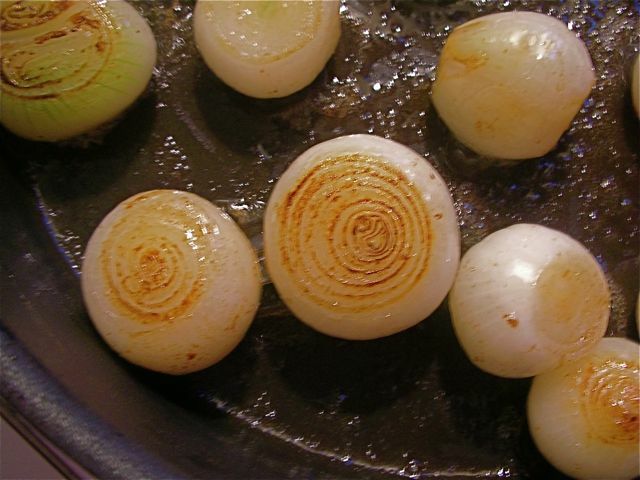 Call me crazy, but I think browning onions are beautiful. 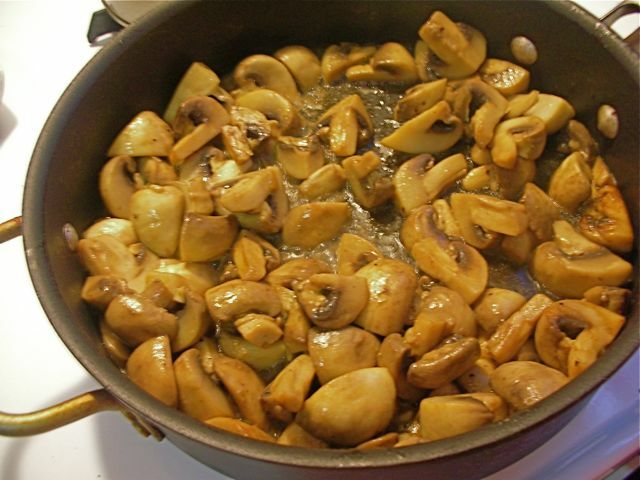 Next, I prepped the Champignons Sautés au Beurre, aka sautéed mushrooms (note: the Julia recipe is only for one batch, aka ½ lb. 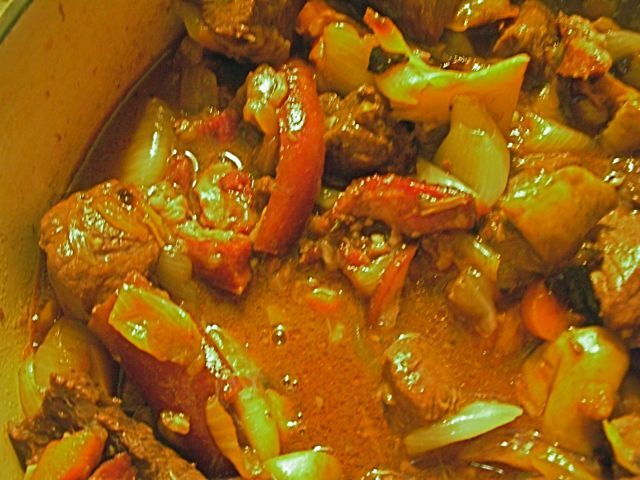 of onions, but since you need a pound’s worth to put in the bourguignon, I had to do a double recipe. 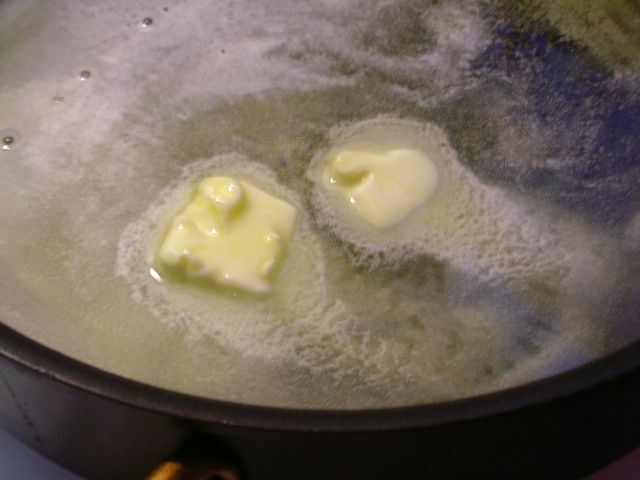 Again, almost 6 tablespoons of butter and oil, but that’s the basis of most highly delectable French cooking. Mushrooms, tossed around in butter and oil a few minutes (not too crowded, Julia says it’s bad for their browning potential) first soak up the fat, then plump up golden brown. 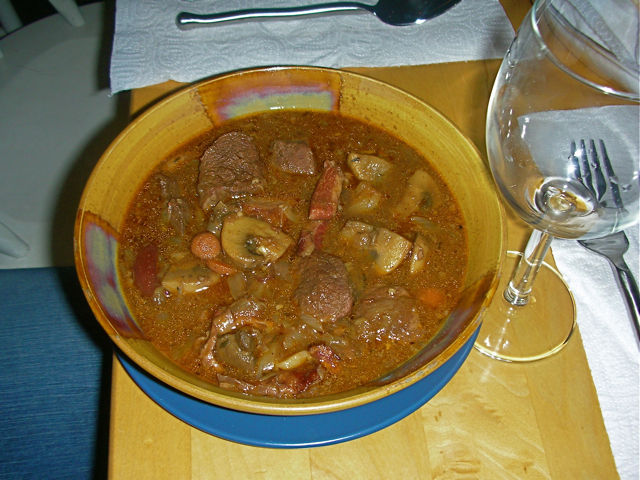 Back to the bourguignon: after 2 hours have passed, I took it out of the oven and discovered a wine-y, beef-y, bacon-y goodness that can only result from slow, careful, time-consuming cuisine. 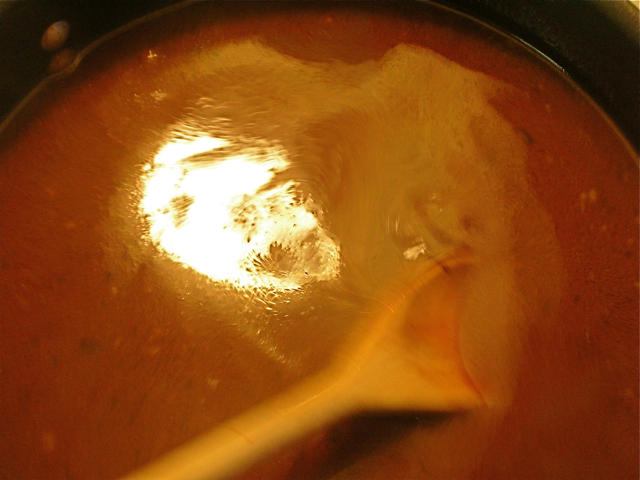 Once the sauce was thick enough (coating my wooden spoon), I added it back to the stew, which now contained the cooked mushrooms and onions, and stirred it all together, keeping warm until ready to serve. After this recipe, over 5 hours spent in the kitchen, I was exhausted, but ready to share this spectacular, savory, brisket-y, onion-y, mushroom-y delight with friends. And they LOVED it—not an ounce was left. Just the way Julia would want it. Bon Appetit!